Nations Press feature 63-Year Old From Bacolod, Graduates From Elementary Even While He's In Jail! 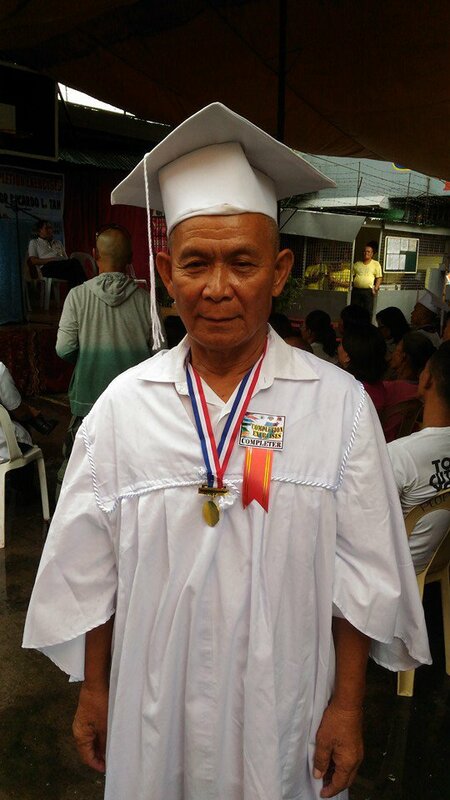 63-Year Old From Bacolod, Graduates From Elementary Even While He's In Jail! A 63-year-old inmate named Rod who hails from Barangay Culipapa in Bacolod, Negros Occidental in central Philippines did not let being in jail and being old hinder him from finishing his elementary education – and along with 19 other inmates at the Metro Bacolod District Jail, he went up the stage to receive his diploma last Monday, August 8, 2016. He was the only one in the batch who graduated from elementary while the rest of the inmates finished their high school education. All of them were finishers under the Alternative Learning System (ALS) of the Department of Education (DepEd). The warden of the Metro Bacolod District Jail, J/CINSP Jonairy Sitchon revealed that the Bureau of Jail Management and Penology (BJMP) has long collaborated with the DepEd for the ALS program for the inmates to be able to finish their studies even while they are in jail. To date, the program is on its fifth year at the Metro Bacolod District Jail and has helped scores of inmates not just in Bacolod but also in many parts of the Philippines finish their studies and eventually have a better life outside of the jail when they are set free after serving their sentence or winning their case.